Saturday morning I was at Sacred Heart Church on Liverpool Rd Birkdale where along with their partner parish St John's Stone in Ainsdale (jointly known at HeartStone) they were working through their priorities for the next few years. 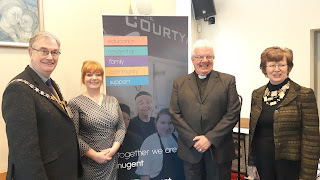 The priest Father Slingo had invited Nugent charity to show case their local work: Margaret Roper House, Clumber House and Clarence High School. I shall be visiting all these projects in the near future. Nugent CEO Normandie Wragg introduced each project in turn and after lunch the parishioners committed to working alongside the charity. More about my visits to these projects later on.